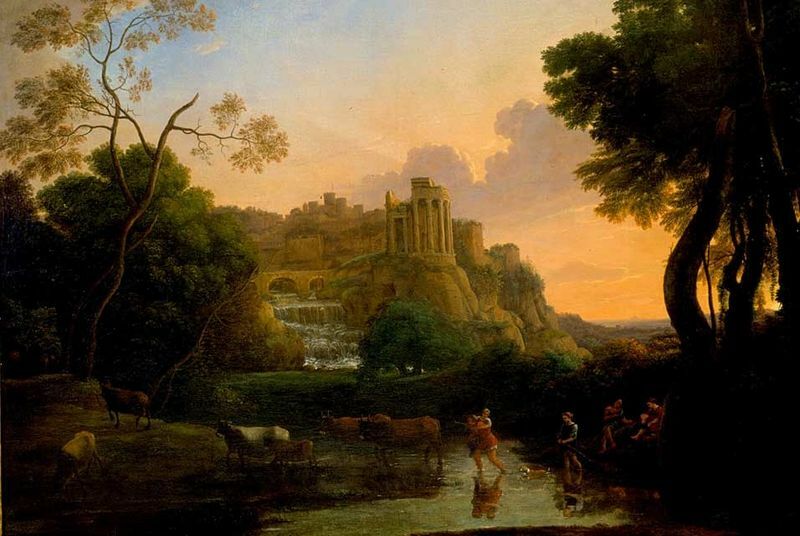 Claude Lorrain's View of Tivoli at Sunset is a gorgeous, idealized depiction of the ancient Italian town of Tivoli. Situated around thirty kilometers out of Rome, Tivoli boasts some of the nations' finest ancient ruins and Renaissance palaces, including the Villa Adriana, Roman emperor Hadrian's residence of choice, and the magnificent Villa d'Este, constructed in 1550 atop an ancient Roman monument. Tivoli was a popular tourist spot during Claude's lifetime in the 17th century, and continues to be one today, both for its history and its rugged vistas and beautiful view of the city of Rome. 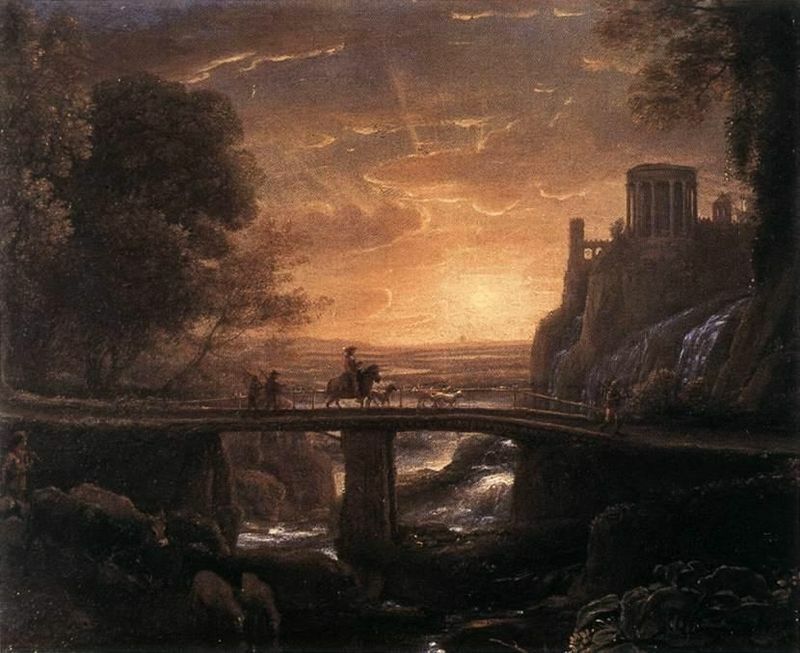 Claude Lorrain was particularly enamored by the site, and in fact depicted Tivoli in paintings or drawing at least 30 times. During the 1640s, Claude was painting for a wide variety of patrons. These included Rome's most elite (like Giulio Rospigliosi and Philip IV, King of Spain), local and foreign nobility, and wealthy tourists looking for a lovely souvenir. 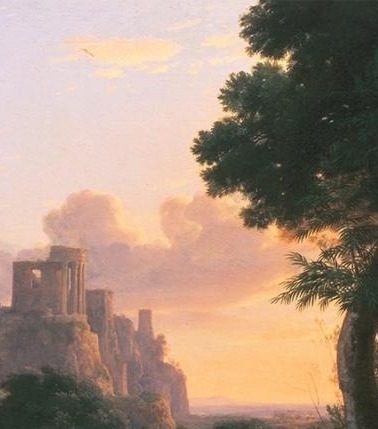 Claude Lorrain was a master of light and the glowing luminosity of View of Tivoli at Sunset is simply breathtaking. This view of twilight is cast in delicate tones of orange and lilac, and the misty, almost otherworldly light ensures a moving, nostalgic tone. 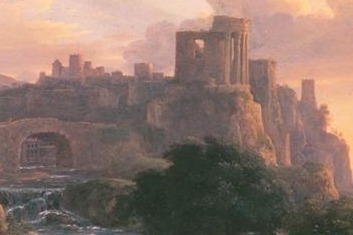 Claude was a master of atmospheric perspective, or the technique of creating the illusion of distance or depth by changing the color, scale, and handling of objects in the background of a painting. The rules of perspective hold that the further away an object is from the viewer, the smaller and less distinct it appears. Claude was skilled in both atmospheric perspective and linear perspective, techniques which allowed him to create seemingly deep, three-dimensional space. Claude was a great lover of animals; an entire album of animal sketches is attributed to this French Baroque painter, and Claude is known to have executed at least 50 sketches of cows alone. The relationship of herdsmen to their animals seems to have been a subject close to Claude's heart, perhaps in part due to his own humble beginnings as a peasant boy in rural northern France. 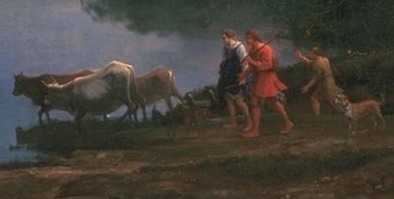 In View of Tivoli at Sunset, the foreground figures consist of a group of shepherds herding some sluggish cows and sprightly goats, a mastiff quick on their heels. Claude's human figures are often criticized as being curiously formed, even poorly-drawn, but his depiction of the animals is nothing less than masterful. Claude Lorrain absolutely adored Tivoli, and spent much of the 1620s and 30s wandering its rugged cliffs and sketching continuously. Claude would then take these sketches back into the studio and use them as inspiration for his final paintings, a practice which gave the final composition a strong naturalism. At the same time, however, these images are examples of an idealized naturalism; these are imaginary, perfected views of nature. A warm, misty, captivating light diffuses Claude's various views of Tivoli, which sometimes seem almost like otherworldly, Arcadian visions. 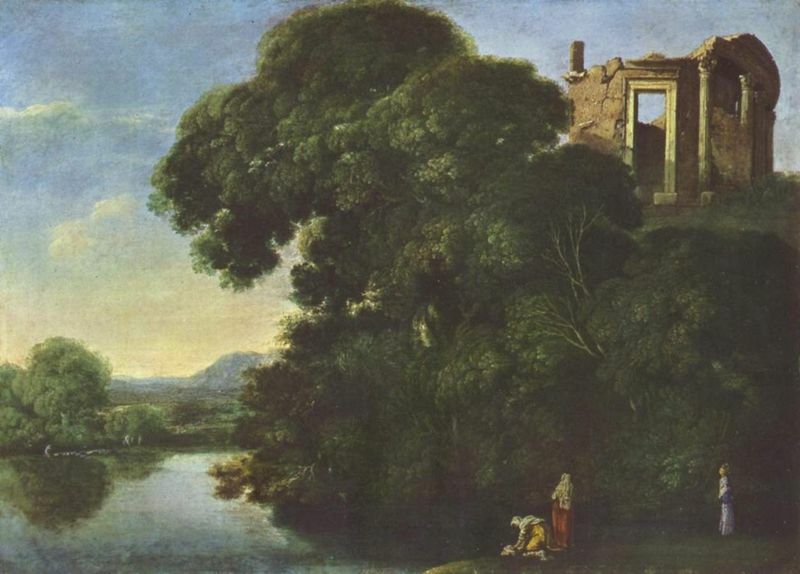 Claude wasn't the only artist to be enamored of Tivoli; Adam Elsheimer's painting of a temple in Tivoli is just one example of the many artists throughout history who have immortalized these views in paint. This German painter of the early Baroque period was one of the most talented landscape painters in history, and was surely an influence on Claude's development as a painter. Elsheimer's picture, as always, is meticulously painted and rooted in a strong (though idealized) naturalism. Unlike Claude's paintings, the illumination is clear and bright, and the feelings of nostalgia, wistfulness or mystery that so often infuse Claude's images is nowhere to be found in Elsheimer's version. 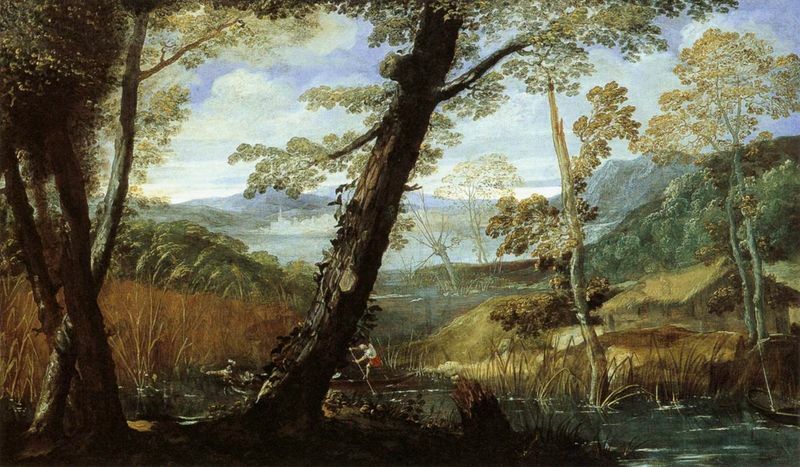 Claude Lorrain's paintings are absolute points of reference in the genre of landscape. 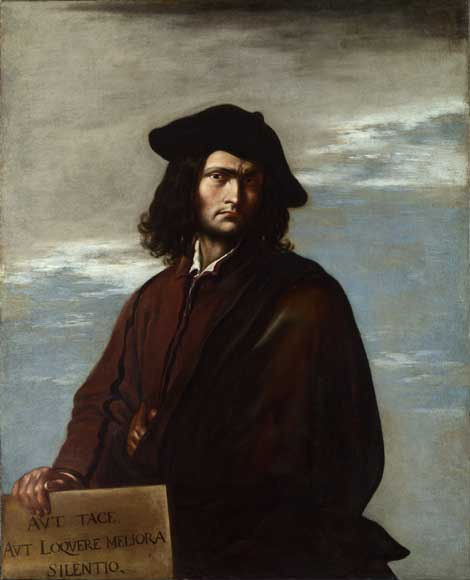 Building on the foundation laid for him by artists like Titian and Paul Bril, Lorrain was the bold leader of the 17th century ideal landscape. 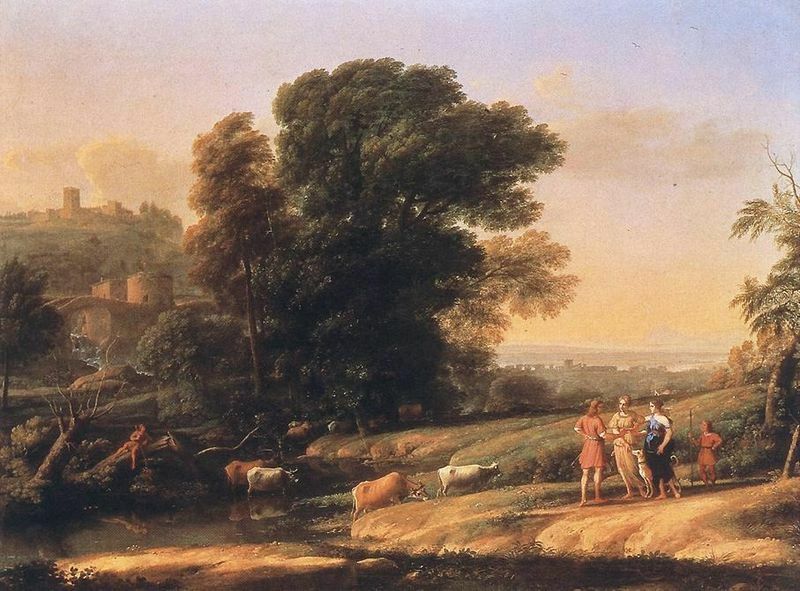 Although landscape painting was long perceived as a "lesser" genre, Lorrain achieved enormous success in his own lifetime, and continued to exert a powerful influence on French and English painting for centuries after his death. 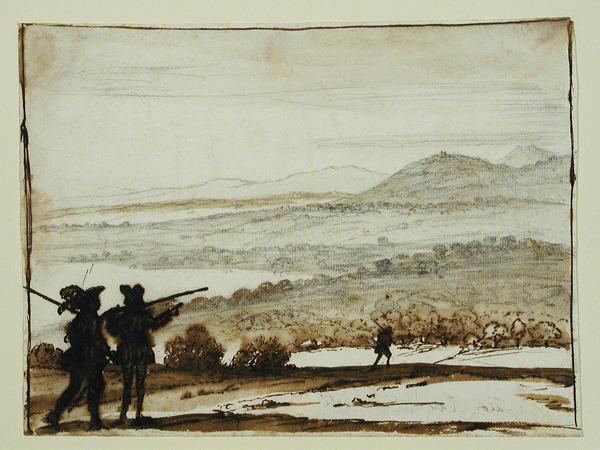 The 1640s saw a real shift in Claude Lorrain's painting production. After the bustling activity of the previous decade, during this period Claude began to slow down. He reduced his patrons to only the most elite, and began painting fewer, but much larger, more intricate paintings. Having lived in Rome for over ten years by now, the northern style that had informed Claude's earlier paintings was replaced by an Italianate classicism borrowed from Bolognese landscape painters Annibale Carracci and Domenichino. Claude's early paintings are steeped in the northern European landscape tradition, complete with charming picturesque details and compositional surprises. As is unsurprising for an artist who studied and worked in Rome, however, as Claude matured his paintings became increasingly classical in tone and theme. The later works are cooler and more idealized, and exude a more melancholy, wistful atmosphere than the more cheerful, bustling early pictures.